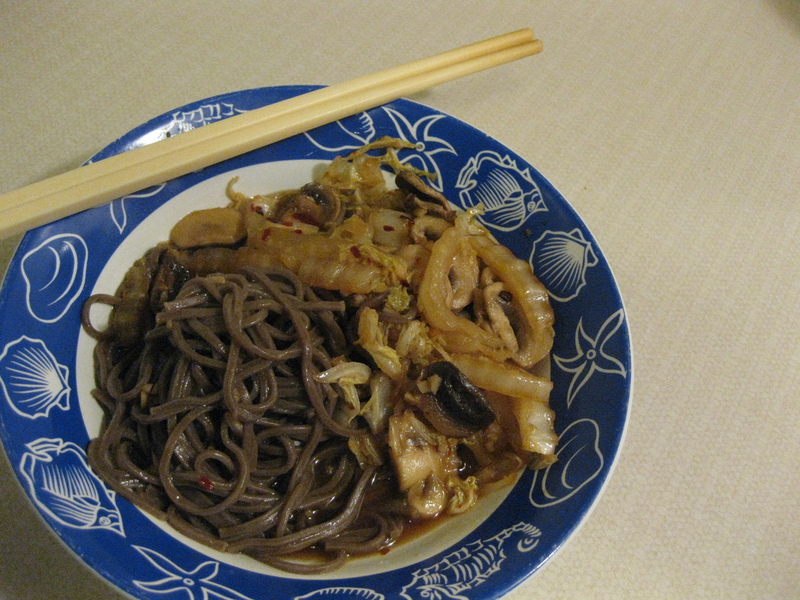 veganmofo 13: Soba! | Go Fork Go! I am in love with soba noodles. They are the right thickness/chewiness. Closer to the asian noodles I grew up eating than pasta. And unlike my attempts to cook dried chinese noodles, they actually cook right and don’t end up impossible to eat. They are also more nutritious than most typical pastas/other noodles. From the first time I tried them (about 2 weeks ago), I was in love. Unfortunately, if you’ve been following this blog, you will have seen that my attempts at finding a sauce that I liked have been kind of meh. Happily, I can now say that I think that I have found my sauce and it is courtesy of Eat, Drink and Be Vegan. Which also happens to hold my favourite oatmeal-raisin cookie. It’s funny. Before veganmofo, I had only made one recipe from ED&BV and didn’t like the book much. I have now found two of my favourite recipes from this book. I’m rather motivated to try the other recipes now, especially as the Supercharge Me! cookies came out great too! That’s also a go-to recipe for when I want a healthy-ish cookie. 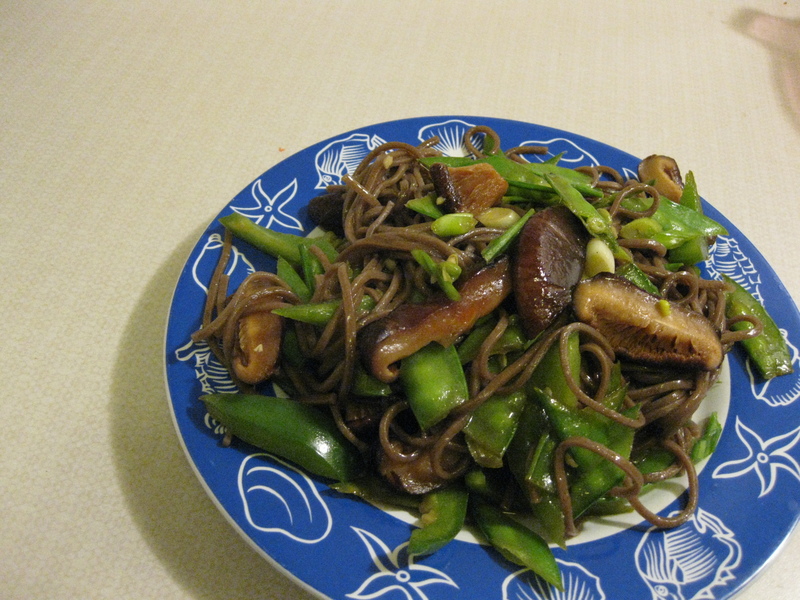 Deserving a honorable mention is the Galic Sesame Soba Noodles recipe from Chef Chloe. I made these last week (see? I have an obsession with soba noodles) and they were decent but not my favourite. I guess one thing to keep in mind is that I grew up with oyster sauce and hoisin sauce when it comes to asian noodles so my tastebuds are probably kind of random or something… I like certain flavour combinations more than others. I’m also partial to have a bit of sweetness in my dishes, even the savory ones, and it drives some of my friends crazy. I don’t love sweet things in general (my ability to eat chocolate is generally limited to one halloween-sized bar unless I’m really stressed or something) but a bit of sweetness in my food is awesome. I’m not talking about a boatload of sugar or anything. For example, I don’t like salads unless there’s fruit on top of it. Oatmeal requires fruit on top of it. I like the sweeter vegetables… summer peas, baby carrots and stuff like that. I like the sweet sauces like hoisin and teriyaki. Am I the only person like that? I’m not crazy, really! I guess it means I like sweet things but I prefer naturally sweet things (simple sugars) rather than the processed kind. Go me! Once upon a time, I was addicted to chocolate and pop and processed sugar. I’m glad that’s changed. ← veganmofo 12: More Cookies!